Located in KIM 2211, this state-of-the-art lab conducts research into human-machine interactions and interfaces; high-definition broadcast and entertainment systems; content-based multimedia data archiving and retrieval; and wireless multimedia communications. Equipment includes high-definition display systems; a sound room with high-quality, surround-sound systems; high-performance graphics workstations for image and video processing applications; high-quality video cameras; and multi-processor workstations. 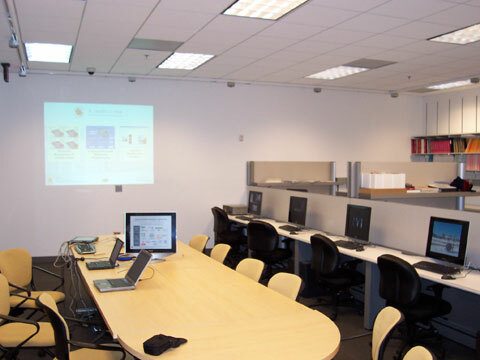 Located in AVW 2454, the Communcations and Signal Processing Laboratory is equipped with Unix and Windows workstations, laptop computers, and a multimedia projector. The lab also is equipped with a wide array of software used for programming, simulation, and development in the context of the signal processing and communications research. For more, please visit www.cspl.umd.edu.